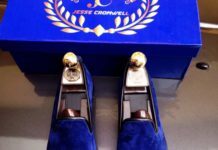 Say goodbye to aching feet on your big day with this unique and comfortable shoe collection. 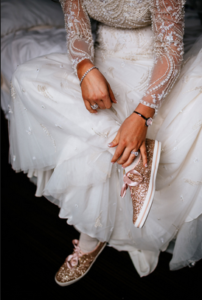 Tennis Ace Serena Williams got married late last year and famously wore trainers to party with her new hubby. 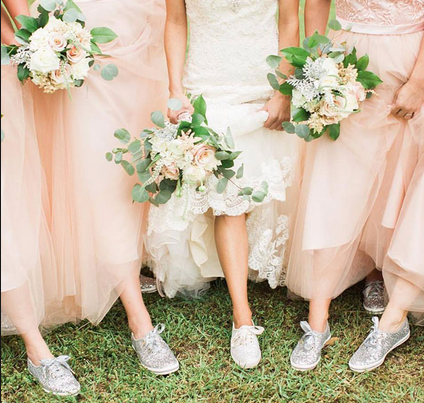 The trend for valuing comfort over style on one’s big day is growing but thanks to Kate Spade and Keds, you can have both rolled up in one special collection created with brides in mind. “Our wedding collection is the perfect union of ease and glamour for everything from the bridal shower to bridesmaids’ gifts to walking down the aisle to happily ever after,” reads Ked’s official site. 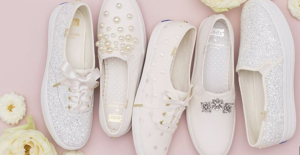 Keds’ classic Champion and Triple-Decker silhouette come in ivory, gold, and silver, and feature flirty floral appliqués, dreamy pearls, glitter, and polka dots. The Champion Glitter lace-up sneakers each come equipped with satin laces. The collection answers the prayers of every bride who dreads wearing heels on her happy day and means that you can cut some shapes on the dance floor at the reception just like Serena.